The previous owners left behind a lot of junk in the barn when they moved out. We did find some pretty neat treasures when we were filling the dumpster! This old door caught my eye when we pulled it out of the pile and I knew I had to make it into something! 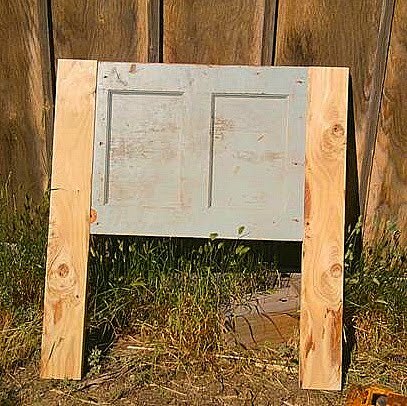 Since the boys would need headboards for their new beds and this door would make perfect ones!! We cut the door down and added 2x6 boards to each side to add a little on the length and add legs. I lightly sanded the headboards and put a coat of primer and paint on. The door had quite a few dents and dings which I loved because it added to the character of headboards. The best part was the total cost of these headboards was $1.02 for the 2x6. We got both boards out of the cull bin at Lowe's for a whopping .51 cents a piece! I love a cheap make over!! Absolutly love it!! How creative and I love the red!!! I love the look and it's one of a kind since I've never seen this in a furniture store! The color pops nicely. Great job! Please take a look at the headboards I have made from doors and give me your feedback. Mom of 2 highly entergetic boys, and part time "mom" to 5 others. I am always counting down to nap time so I can spend a few creative minutes to myself! The Boys Room Is Compleate!